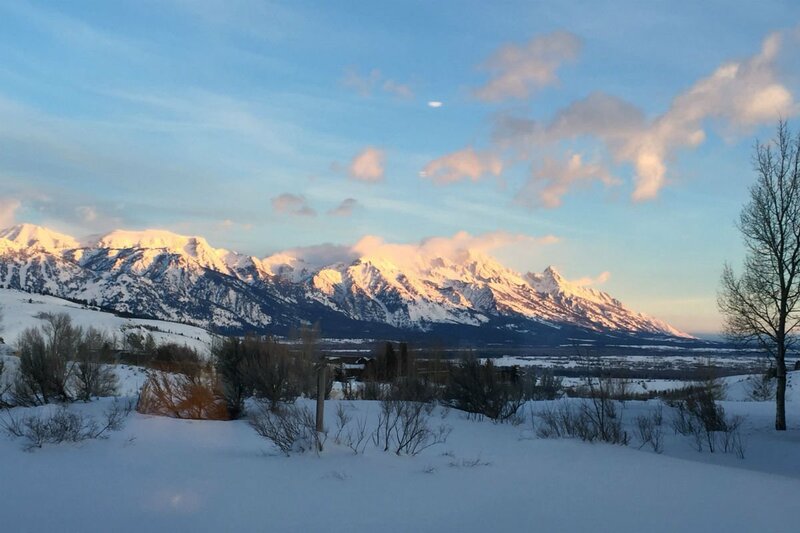 Sunrise over the Teton Mountains. All photos by Devorah Klein Lev-Tov. Feeling a little rusty on the slopes? Get back on the trail in the best possible surroundings. 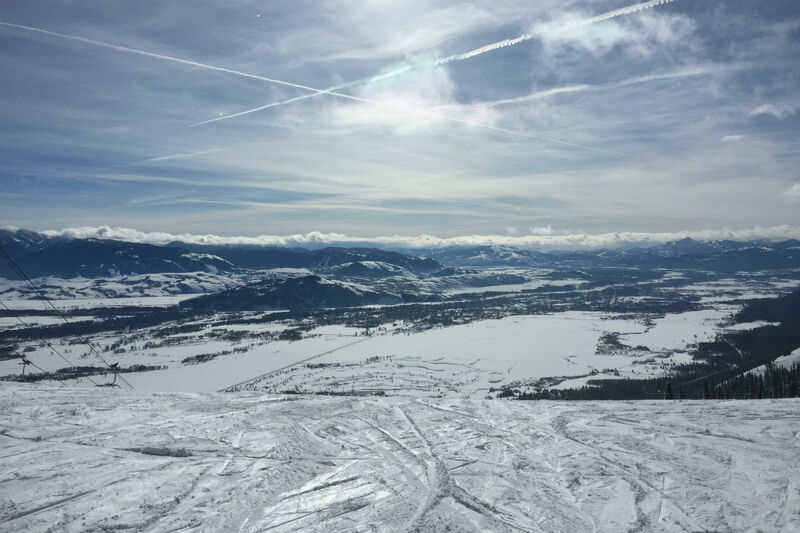 JACKSON HOLE, Wyoming – I was prepared for frozen tundra. And shortly after me, my husband, and our 4-month-old baby arrived in Jackson Hole, Wyoming, from New York, it started to snow. “Well, this it,” I thought, wondering, not for the first time, why we had decided to come here rather than some place like southern California or Aruba. I checked again that I had brought all three snowsuits of varying degrees of warmth for the baby — could he wear them all at once? We arrived at our cabin in Spring Creek Ranch, a sleepy resort about 20 minutes from downtown Jackson (Jackson is the name of the city, Jackson Hole refers to the entire valley, or “hole” area formed by the surrounding Teton Mountain range). We made ourselves comfortable on the cozy couch by the blazing fireplace, where I decided I would be happy to spend the whole weekend. The next morning we woke up to a glorious view. Those Tetons are pretty insane: gigantic, craggy, snow-covered. As the sun rose (I don't know if I'd call this a perk, but when you have a four-month-old, sometimes you get to see those), it bathed the mountain in a soft pink and gold glow. Even though it looked cold, I knew we had to see those mountains up close. A sitter from Jackson Hole Babysitting arrived right on time and patiently listened to me tell her every detail about our baby, most of which she surely didn’t need to know (no one cares that baby was gassy last night), before my husband and I bundled up for a day of skiing. Chairlift to heaven at Jackson Hole Mountain Resort. 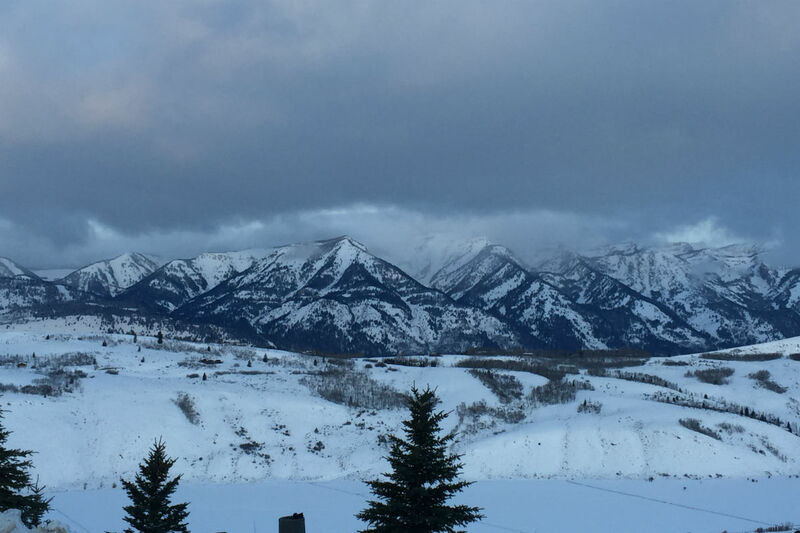 Views from Jackson Hole Mountain Resort. 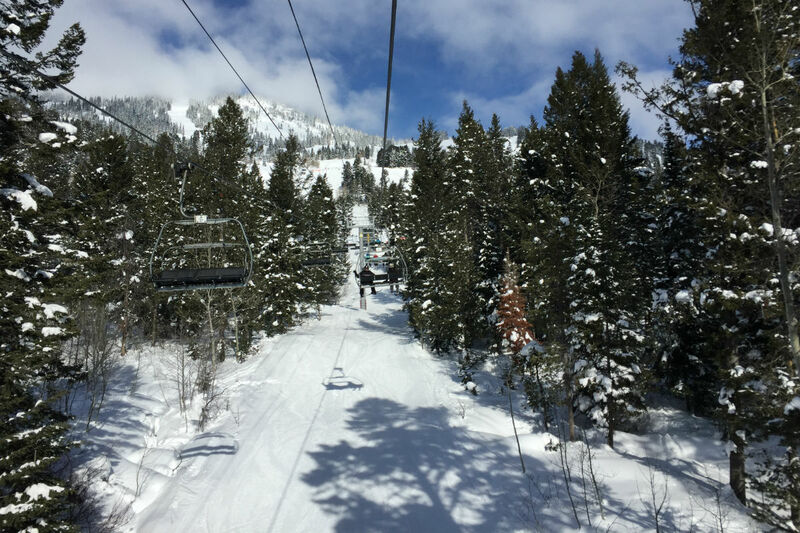 The Jackson Hole Mountain Resort in Teton Village, the largest ski resort in the area, is about 45 minutes from downtown Jackson and 30 minutes from our hotel. After breezing through our ski rentals at Jackson Hole Sports, we geared up for the slopes (pro tip: they might lend you old goggles from the lost and found box). It had been a few years since either of us had skied at all, and for my husband it was his first time skiing out west. We started on the bunny slopes to get our ski legs. Even these are beautiful, with the sun-kissed mountains rising in the background and snow-covered evergreens dotting the landscape. We soon began peeling off layers. Although the temperature was low, the sun was bright and strong and we could feel the burn of a good workout. After a few more green runs, we graduated to the intermediate trails. Several lifts took us higher and higher up the mountain, where we were rewarded with incredible vistas and longer runs. We also rode the gondola, an enclosed lift that fits up to eight people. A young person across from us packed a bowl and generously passed it around. Ah, fresh mountain air. 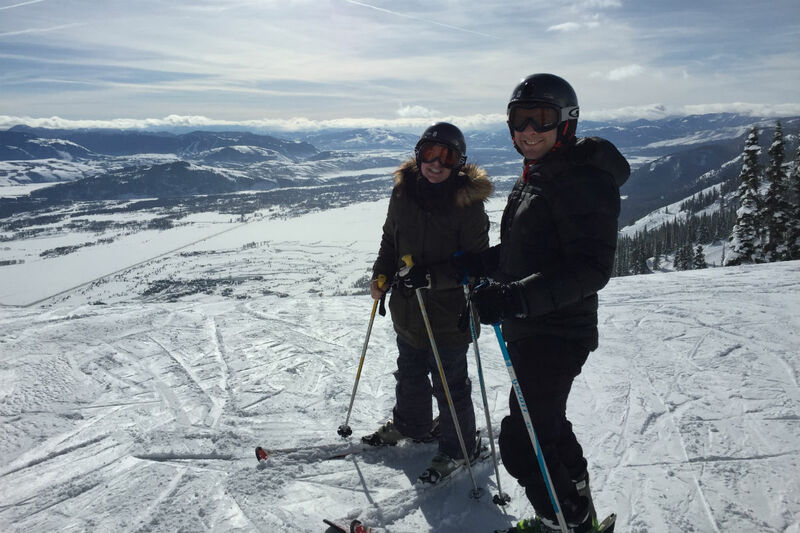 The author and her husband on the slopes. 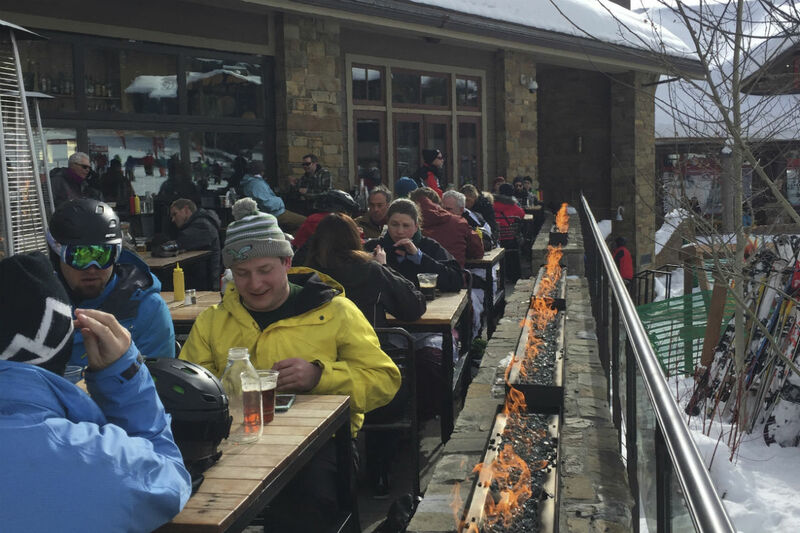 Outdoor dining next to a cozy fire at Handle Bar. The day was exhausting, but in that over-exercised kind-of-way. We relished our long, hot showers and spent the evening cuddling with baby by the fire. I was most excited for the next day's wildlife safari. I haven’t been to Africa (yet), but I love animals and always go out of my way to see a region’s flora and fauna. Animal scouting in winter?! I was unsure of what to expect but very excited. I’ve had a long-time dream of seeing a moose. It started in college, on a trip to New Hampshire’s White Mountains with my boyfriend at the time. I’d heard there were moose and I was determined to see one. On our way there, we could hear gunshots — it was hunting season. After getting lost, we turned into a gas station and my boyfriend went inside to ask for directions (this was pre-Google Maps era). As I waited in the car, a large pick-up truck pulled in alongside our car. I turned to look and was confronted by a gigantic moose with enormous antlers, lying on its side, tongue hanging out of its mouth. It was very dead. Not quite what I had in mind. Our guide, Dawson Smith, the resident naturalist at Spring Creek Ranch, picked us up early. After loading the baby in the roomy and warm SUV, we were off to Grand Teton National Park. I mentioned the moose, but Dawson made no promises. We were just barely five minutes outside the ranch when Dawson spotted a bald eagle perched above us. Thanks to the sunroof we didn’t even have to exit the car. From there, we continued into the park. Covered in several feet of pristine white snow, we had the place to ourselves, or so it seemed, then noticed various tracks — we were not alone. The park was teeming with all kinds of animals and soon Dawson pulled over alongside a river. There, directly across from us, were two large moose on the riverbank. The creatures were just as majestic as I hoped, although they were antler-free: they shed them every few months. We spent a long time watching them through binoculars and a scope, and we soon noticed two more further along the bank. Suddenly, two gigantic trumpeter swans flew across the field right in front of us, their wingspan a good seven feet. 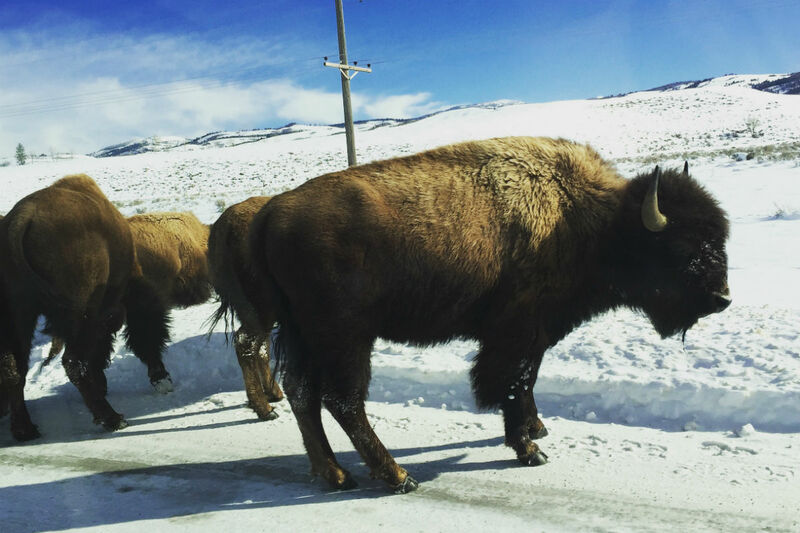 Up close and personal with bison. 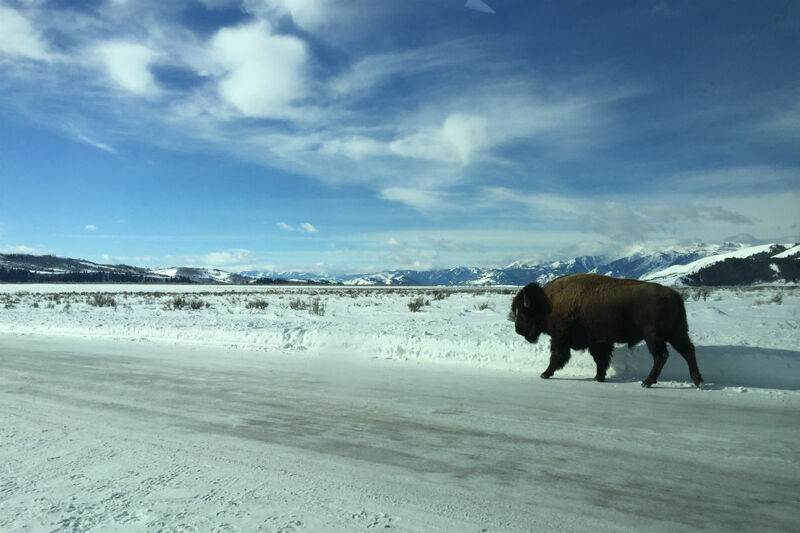 Feeling like we were in a nature show, we returned to the car and continued through the park, where we came upon a sizeable group of bison ambling through the snow. These beasts were so large and strong they could plow through the immense amount of packed snow with little effort. Soon they took over the road and we had no choice but to wait until they moved out of our way. They seem pretty docile, and almost friendly, but Dawson warned us not to get too close, reminding us how strong they are and telling us that tourists have unfortunately been killed by them several times. A foxy sighting at Grand Tetons National Park. After a break near the Kelly Warm Springs (a constant 81 degrees) Dawson stopped the car once again. I didn’t see anything, but then he pointed out a small dark lump in the snow. 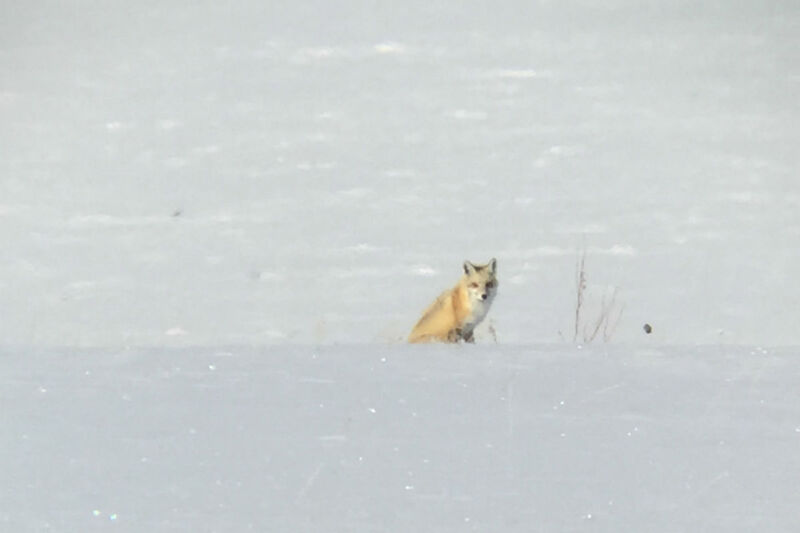 Pulling out the binoculars, I saw it was a red fox. It was beautiful, a striking flame against the whiteness. It was watching the ground below intently. Suddenly, it dove headfirst into the snow, seeing something it wanted to eat. It came up empty, but it kept watching and diving. 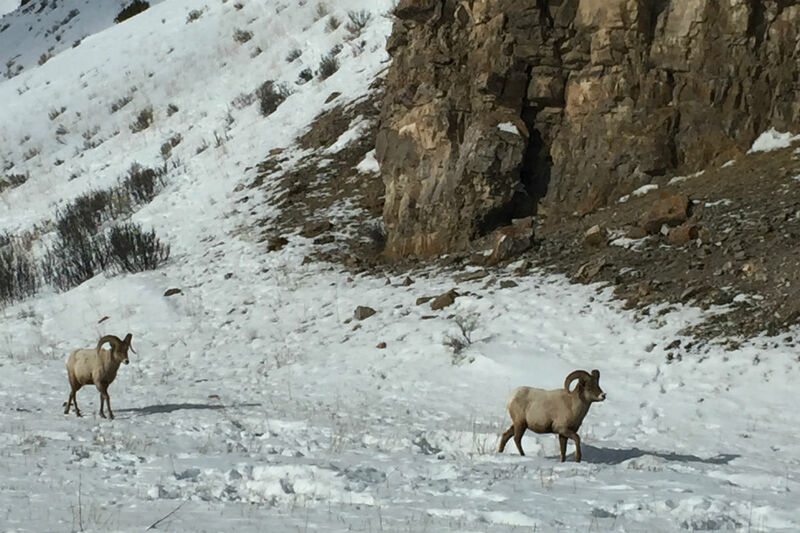 Big-horned sheep at Grand Tetons National Park. 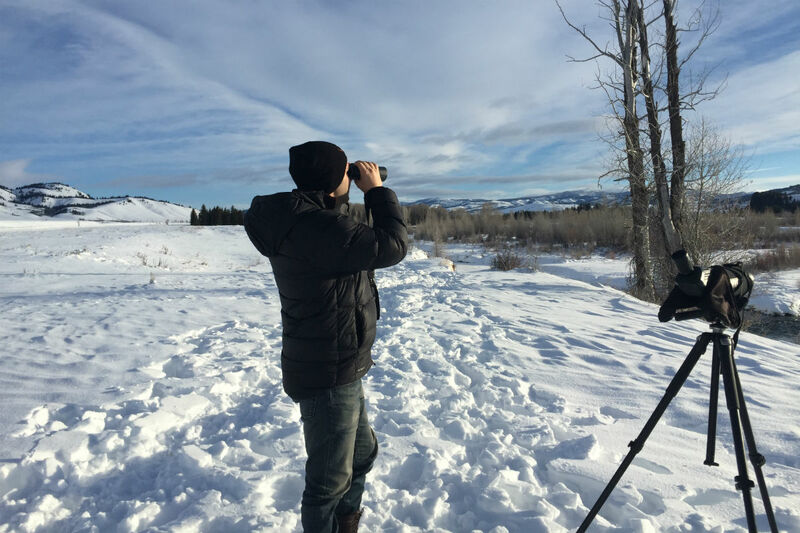 We were also treated to coyote and big-horned sheep sightings, as well as what Dawson identified as wolf and snowshoe hare tracks in the snow. And of course, those Grand Teton Mountains were always there, providing a glorious backdrop. The Grand Tetons in all their glory. Dinner that night was at Bin22, the newest of local restaurateur Gavin Fine’s many establishments. Inside a wine shop, patrons can purchase any bottle of wine they find in the store — and there are plenty to choose from — to pair with small plates like duck rillete and house-pulled mozzarella with pesto. Though we were surrounded by pricey wine bottles from around the world, the scene was convivial and unpretentious. Maybe it was the (delicious) mini ice cream sandwiches for dessert? As we packed up our things the next morning, the sun shone brightly. I checked the weather in New York. We were about to have the coldest week of winter so far.